When visibility ahead is limited. If you might hit another vehicle. When driving near a blind pedestrian, using your horn may be dangerous. Yield to the pedestrian and proceed when it is safe to do so. Start to prepare to slow down. Sound a sharp blast of your horn. If there is danger, you may need to sound a sharp blast on your horn. Do this when a child or any other pedestrian is about to enter into the street in front of your moving vehicle. Which of the following driving skills is/are affected by the use of alcohol and/or drugs? Alcohol and other drugs can negatively effect a number of skills needed for safe driving, including a driver's reaction time, coordination, alertness, and ability to concentrate. Should drive more slowly than other traffic for 200 feet. Should wait for a large enough gap to get up to the speed of traffic. Should wait for the first two vehicles to pass, then drive into the lane. Any time that you merge into city or highway traffic, you should wait for a gap in traffic large enough for your vehicle to get up to the speed of other traffic. 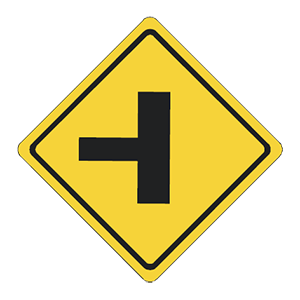 This sign indicates that there is an intersection with a side road ahead. In order to see potential hazards early. Because it takes a quarter of a mile to stop your vehicle completely. Because it helps you keep up with traffic. On the freeway, be ready for changes in traffic conditions. Watch for signals from other drivers. Expect merging vehicles at on-ramps and interchanges and be prepared for rapid changes in road conditions and traffic flow. Follow the large vehicle closely to reduce wind drag on your vehicle. Avoid driving beside it for long stretches of time. Drive on its right side when on curves and hills. Because large commercial vehicles have large blind spots on each side, you should avoid driving beside them for long periods of time. Only to drivers with the appropriate license plate or hanging tag. To anyone, but only if all other spaces are occupied. To people who are not feeling well. Reserved handicap parking spaces should be used by persons with a mobility disability or other disability as defined under state law. In order to park in a handicap parking space, you must have either the appropriate license plate with the international symbol or the designated hang tag.